USC Dornsife senior Evangeline Alva travels to the Amazon as a research assistant of the Desano Language Documentation Project, directed by Dr. Wilson Silva, a linguist at the Rochester Institute of Technology (RIT). Dr. Silva's project, currently funded by the National Endowment for the Humanities's grant for the Documentation of Endangered Languages (DEL/NEH), aims to document Desano, an indigenous language, spoken in Brazil and Colombia. Deep in the Amazon, Evangeline Alva had just awoken from a nap when she heard her first words in Desano. "A man said to me 'Good morning, sleepy head,' " the linguistics major at USC Dornsife recalled of her research trip to the town of São Gabriel da Cachoeira in the Brazilian Amazon. Alva, who speaks an impressive total of 10 languages, had traveled to this destination this past summer to assist with Dr. Silva's research project for documenting the Desano language. According to Dr. Silva, Desano is now spoken fluently by only 150 people in Brazil. Desano is also spoken in Colombia where the number of fluent speakers is higher. The language belongs to the Eastern Tukanoan language family, a group of 16 languages spoken by small groups fundamentally segregated by language. The estimated number of people speaking all the Eastern Tukanoan languages is 28,000. An endangered language is one that has very few native speakers, or is in danger of extinction due to many factors, for example, lack of recognition by the government, the spread of the dominant local language or lack of resources for its continual education within the community. Since the mid-19th century, the number of Desano speakers is decreasing. One reason for the language's decline is that the people are leaving their traditional lifestyle and moving to the urban areas, where Portuguese, Brazil's official language, is spoken. Fewer and fewer children are learning to speak Desano. "Rather than transmitting Desano to their children, parents are starting to enforce the lingua franca or Spanish or Portuguese because they want them to be able to assimilate into other cities in Brazil or Colombia," Alva said. "So there is little emphasis on preserving language and cultural practices at home." The problem is aggravated by the fact that the last pure speakers are dying. Little educational materials are available for schools. In Brazil, Alva worked under the supervision of Dr. Silva, Rochester Institute of Technology's linguist and the director of the Desano Language Documentation Project. 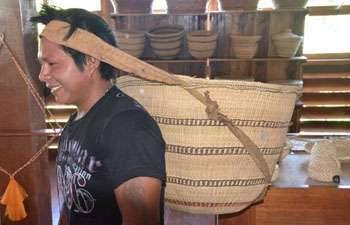 Alva's fieldwork experience was funded by Dr. Silva's Desano Language Research Project (DEL/NEH grant). Since its beginning in 2007, the Desano Language Documentation Project has received funds from the Endangered Language Fund (ELF), The Hans Rausing Endangered Languages Project (ELDP/SOAS), the National Science Foundation (DEL/NSF), and the Museu do Índio of Rio de Janeiro. Also helping to fund Alva's participation in the project was USC Dornsife's Summer Undergraduate Research Fund (SURF), undertaken with the guidance of her mentor Khalil Iskarous, assistant professor of linguistics at USC Dornsife. Her focus during the linguistic fieldwork experience was to assist with the Desano Language Documentation Project, and, more specifically, to work with the indigenous researcher to enter written and visual data into the digital dictionary database, one of the main goals of the project. "I also helped record how Desano-speakers interpret time and define color, their typical lifestyle and their old stories that carried on into modern day beliefs," she said. "I studied whether they still maintain the tradition of marrying out into another tribe, as well as taboo subjects such as sexuality and religion." A typical day for Alva included an average of seven to eight hours of work, which included assisting Dr. Silva by transcribing and translating Desano data, and assisting the indigenous research assistant with the digital database. Alva also worked with Gelison, a 27 year-old native Desano-speaker and physics undergraduate at IFAM (a Federal Institution in São Gabriel da Cachoeira). Gelison is one of three language consultants working with Dr. Silva to visually document the Desano-speakers' environment. The team of consultants also collects auditory data on the stories and legends of Desano culture, dialects and cultural differences between groups, as well as personal tales of how people resisted colonization. "The local consultants are very passionate about preserving their culture and language," Alva said. "They want to develop materials to teach in the community as well as in the public schools along the river." She helped Dr. Silva to apply language games he had developed, aimed at the elicitation of natural occurring speech with information about location, directions, and color terms. Alva found her experience in the Amazon to be immensely enriching. "I lived amongst the natives, ate their food, studied their culture and traditions, and learned their history through transcribing and translating legends and folk tales. I couldn't have asked for a better research experience to help me with my future."